North Cornwall holds some very dear memories for me. Many weekends of hilarity have been spent on its stunning shores. Not only is the scenery spectacular; the whole place has a great sense of community, which I cherish each time I visit. Introducing the hen, a dear friend and no shrinking violet. 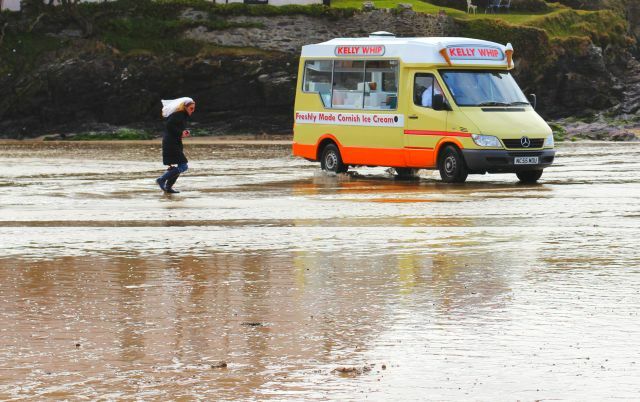 Here she is, commandeering the Kelly's ice cream van on Polzeath beach. We hired vintage style Dawes bikes and rode the Camel trail on what must have been one of the wettest Cornish weekends in history. 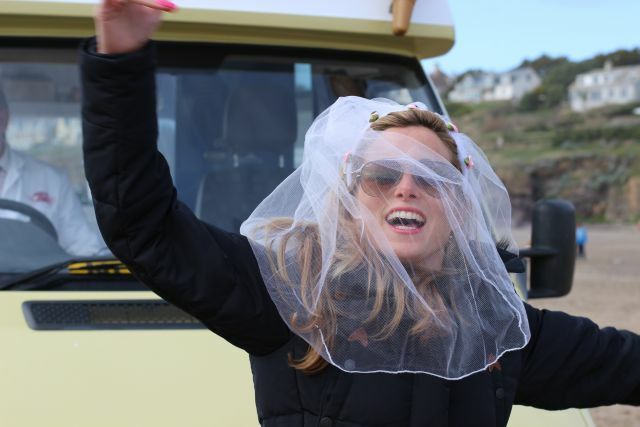 The hen, true to form, kept her veil on the whole way, while I, soaked to the skin, missed the Padstow ferry - distracted by the thought of this Jack Wills jacket which I purchased to keep me warm and dry. While I waited for the lift back I found The Blue Tomato cafe in Rock, which serves an excellent hot chocolate and gluten free chocolate muffins. Check out this beautiful drawing of it and the bay in front by the talented Simone Ridyard. The Fusion Wardrobe shop in Polzeath also had a good day, as most of the party purchased something. I found these fabulous Keith Brymer Jones bowls to match the hot chocolate mugs my sis bought us for our engagement (it's a long story). 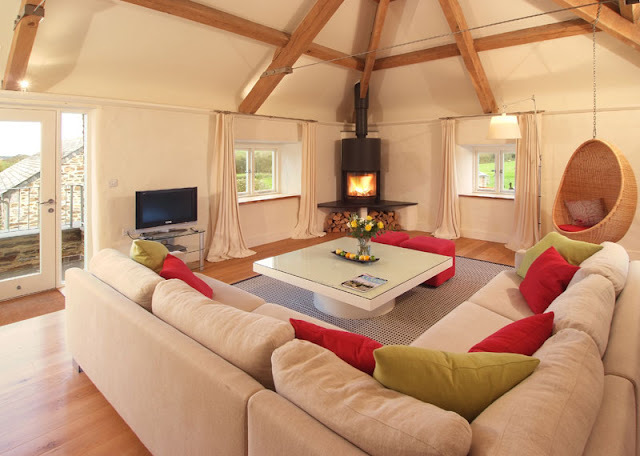 The hens stayed at the stunning Mesmear cottages near Polzeath. Not only did our host Vicky see us right on the bike tour, her son Nick is a mean cook and did us a fabulous dinner on the Saturday evening. If you fancy some surf too while you're here, his brother Andy is involved in Wavehunters, a surf school which he set up after quitting his city job. Clever him. Cornwall, thank you, we will be back. Looks and sounds like a lovely hen. Beautiful location, too.